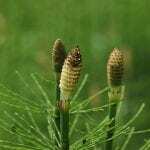 This KBCS nature segment focuses on the horsetail plant, a local plant which has been around since dinosaurs walked the earth. KBCS’s Yuko Kodama took a walk through Seattle’s Seward Park with Ed Dominguez, Audubon Center Lead Naturalist, to discuss the unique characteristics of this plant. Included in the discussion is the fact that horsetail plants reproduce with spores and is sometimes eaten by bears.